First Karen Walker Eyewear brought to you your friendly neighborhood vampires, now fresh off the runway Karen Walker adds a new sunglass to the collection: the Epiphany. 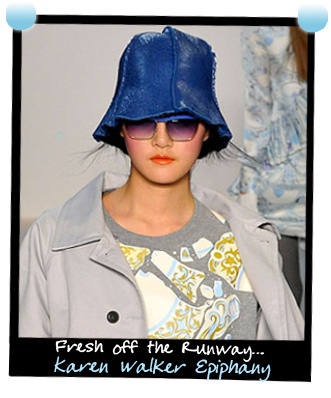 Karen Walker first previewed the style at New York Fashion Week as part of the ‘She’s Cracked’ fall 2009 collection. are a striking shape that fuses vintage and ultra modern elements. Available in two colors. 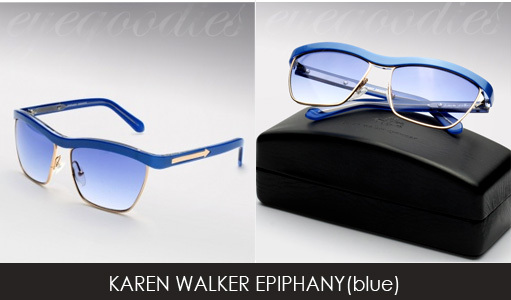 Classic black and fresh blue and gold with blue gradient lenses (shown below). 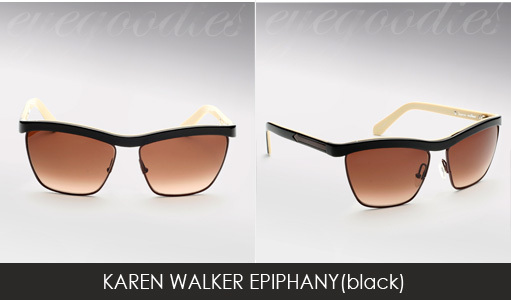 Also available in a rich combination of black and cream with brown gradient lenses, or as Karen Walker terms the color “black chocolate cream”, looks as good as it sounds.